Looking for a meaty fish for your next Nigiri dish? 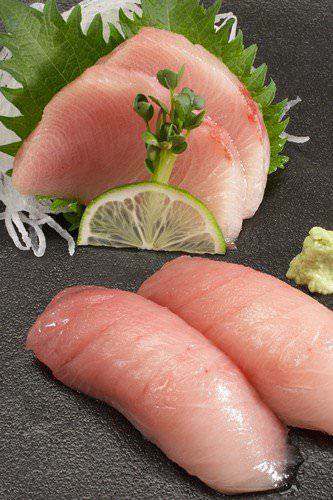 Although closely related to the tuna species, Yellowtail (Hamachi) are naturally higher in fat, and have a distinctively firmer texture. While this alone doesn’t make them a superior choice for Nigiri, the moist, delicate flavor does lend to their reputation as the perfect coupling with white sushi rice. Distinguished by their yellow tail and bold horizontal stripe, Yellowtail are a popular game fish owing to their speed and agility. This makes them much leaner in comparison to tuna, with far less oil content – despite being high in essential fats. Our own Farmed Sashimi Grade Yellowtail originate from Japan, where they are sustainably raised on a natural diet, with plenty of freedom. Fileted within mere minutes of leaving the water, they are then flash-frozen with filtered wood smoke to preserve both their flavor and freshness. Fileting fish prior to making sushi can be a chore, especially if you’re in a hurry. Our premium Yellowtail Filets are sold skinless and boneless in 1.6 lb portions – the ideal size for a small plate of Nigiri, or as part of a light evening meal!